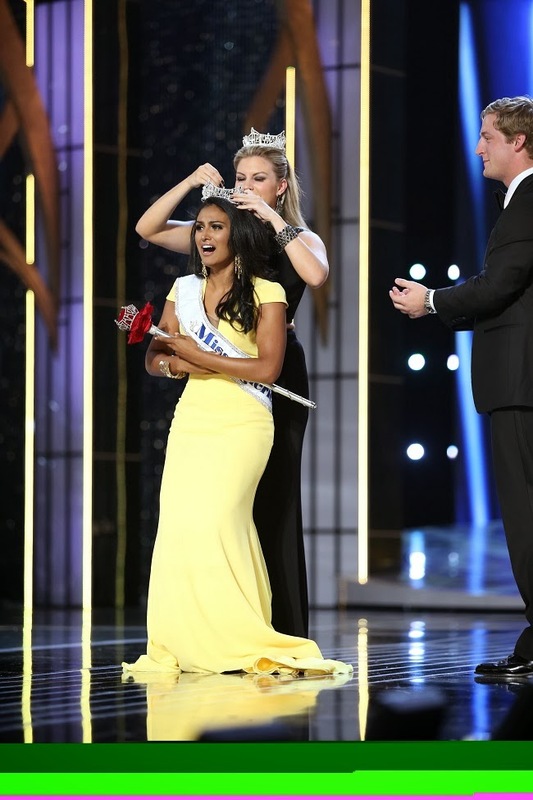 Atlantic City: To the delight of tens of thousands of Indian Americans, a growing, influential and visible community in the United States, Miss New York, 24-year-old, Nina Davuluri has become the first person of Indian descent to be crowned Miss America. As the famous beauty pageant returned to Atlantic City, New Jersey, after a six-year stint in Las Vegas, Davuluri from Syracuse sashayed off with the tiara and the $50,000 scholarship cash as she was chosen to succeed former Miss New York, Mallory Hagan. Davuluri, who was also the first Indian-American to serve as Miss New York, performed a Bollywood dance for the talent part, answered a question about plastic surgery and hopes to become a doctor, like her father. Davuluri studied at St. Joseph High School and University of Michigan. Her scholastic honours include Dean's List; Michigan Merit Award; National Honour Society She competed on the platform issue of "Celebrating Diversity through Cultural Competency" showcasing her talent of "Classical Bollywood Fusion," according to Miss America organisation. Earlier, after a night of big numbers, endless crowd cheering, swimsuit strutting, dancing, singing, the 53 Miss America contestants representing 50 states, District of Columbia, Puerto Rico and the US Virgin Islands were narrowed down to one winner, according to USA Today. The 53 contestants introduced themselves in a taped segment with those quippy catchphrases, including "Listening to your phone calls from the Nation's Capital. Just kidding! I'm Miss District of Columbia, Bindhu Pamarthi." The nearly 100-year-old pageant which debuted in 1921 was televised live by ABC, which picked up the contest again in 2011 after dropping it in 2004 because of a steep ratings decline. The judges were 2004 Miss America winner Deidre Downs Gunn, the New York Knicks' Amar'e Stoudemire, Lance Bass from the boy band 'N Sync, comedian Mario Cantone, violinist Joshua Bell and television chef Carla Hall.